← Greenland’s Glaciers in Exponential Melting? To Save Energy … Turn Off the Lights! “Without rapid action the amount of energy used for lighting will be 80% higher in 2030 than today; however, if we simply make better use of today’s efficient lighting technologies and techniques, global lighting energy demand need be no greater at that time”, said Claude Mandil, Executive Director of the International Energy Agency today in Paris during the launch of a new publication, Light’s Labour’s Lost: Policies for Energy–efficient Lighting. “This important work shows that the potential for energy savings in lighting is simply enormous and can be achieved with technologies that not only are readily available in the market but economically-competitive during the life cycle of the product. Moreover, more efficient lighting also results in lower CO2 emissions”, Mr. Mandil added. If more efficient lighting systems were put in place, that could “slash 38 percent from the world’s lighting bill by 2030,” according to the report. “In the current lighting environment there are enormous sources of waste. Light is routinely supplied to spaces where no one is present,” Mandil said. Application of new and more efficient lighting technologies offer one solution, but even greater potential savings might be achieved by making overall reductions in lighting. Just like clean water and fresh air, artificial light should be considered as a non-renewable resource and conserved. It makes no sense to expend electricity to light up empty parking lots, deserted streets, empty office buildings and in fact the entire sky and adjoining vacuum of space over vast areas of the planet. It seems to Star Phoenix Base that an aggressive campaign to “conserve” light could reduce energy use even more. I am old enough to remember when President Lyndon Johnson signed an executive order decreeing that in the White House any lights in unoccupied rooms should be turned off to save energy. We need more of that kind of pro-active attitude today, because the best way to save energy from lighting is … duh! … to turn off the lights. If you replace an incandescent bulb with a compact fluorescent, you’ll save the equivalent of about 600 pounds of coal over the life of the bulb. This cuts emissions of CO2, nitrogen oxides and sulfur — gases responsible for the greenhouse effect and acid rain — by 65 percent to 70 percent. I can personally attest to the efficiency of compact fluorescents. We have replaced most of the bulbs in our house with them, and have seen an immedaite reduction in our electricity bill. These things work, and if everyone would adopt them it would make a huge impact on our nation’s energy budget. There are other lighting innovations available or coming soon, including bright and efficient interior lighting from LEDs, already familiar in automobile head- and tail-lights. LED lamps of the future will use far less energy than those old-fashioned tungsten bulbs, and without wasting most of the energy as heat. If we all took a close look at our personal energy budgets and took steps to reduce the electricity we use, it would go a long way toward helping avoid future energy crises. When William Shakespeare wrote Love’s Labour’s Lost, he would have used light from tallow candles at a cost (today) of GBP 12 000 for a measure of light. The same amount of light from electric lamps now costs GBP 2, while the supply of artificial light in the country of Shakepeare’s birth has increased 350 000 times! Generally, lighting ranks among the end-uses dominating global power demand. Worldwide, grid-based electric lighting consumes 19% of total global electricity production, slightly more electricity than used by the nations of OECD Europe for all purposes. Lighting requires as much electricity as is produced by all gas-fired generation and 15% more than produced by either hydro or nuclear power. The annual cost of this service including energy, lighting equipment and labour is USD 360 billion, which is roughly 1% of global GDP. Electricity accounts for some two-thirds of this. But the electricity used by lighting is also a major source of CO2 emissions, equivalent to 70% of those from the world’s cars. Light’s Labour’s Lost maps out the means by which lighting demand can be curbed at lower cost than continuing with current practices. It shows that were end-users to install only efficient lamps, ballasts and controls that will save money over the life cycle of the lighting service, global lighting electricity demand would drop substantially and be almost unchanged from 2005 levels by 2030. 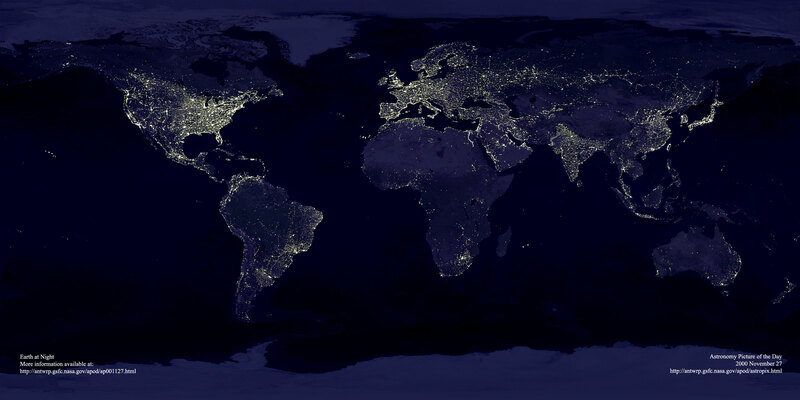 As those nighttime photographs of the Earth clearly demonstrate, lighting is a significant drain on the planet’s energy resources. There is no reason why we have to light up the world like a Christmas tree, and the long-term cost of this unnecessary fancy will be enormous as petroleum, coal and natural gas reserves become depleted. Future generations will undoubtedly look upon those photographs of the glowing Earth at night with awe and wonder. They will be awestruck by the lack of foresignt, and wondering at the arrogant stupidity of our present era. This entry was posted in Diversity Loss, Energy Technology. Bookmark the permalink.